Hague spoke to the US diplomat on 20 March 2010 about his meetings with Cuban government ministers, suggested that ending the blockade could improve US relations in Latin America. The diplomat finished his report with the comment that the Hague's visit to Cuba was evidence that he "appears to be expanding his international credentials by staking out a position on Cuba shared by a number of other EU countries -- and most British voters -- as he prepares to become foreign secretary if, as appears increasingly likely, the Conservatives win the next election." Read the full text of the below. C O N F I D E N T I A L LONDON 000730 NOFORN DEPT FOR EUR/WE, WHA/CCA, INR/B E.O. 12958: DECL: 03/24/2019 TAGS: PREL, UK, CU SUBJECT: WILLIAM HAGUE VISITS CUBA; ADVISES CHANGE IN U.S. POLICY REF: A. ZUNIGA-MCNICHOLAS EMAIL MARCH 20 B. EMBASSY LONDON DAILY MARCH 20 Classified By: Charge d'Affaires, a.i. Richard LeBaron, reasons 1.4 (b and d). 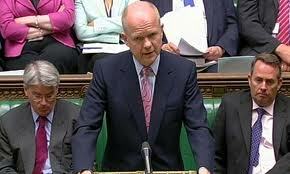 Conservative MP and Shadow Foreign Secretary William Hague offered his views to Charge after a recent trip to Cuba. Hague, a respected politician who may be staking out a "safe" political position on the Cuban issue in advance of becoming foreign secretary, offered these observations: -- that new foreign minister Bruno Rodriguez would likely offer nothing new; -- that Cuba continues to paint the U.S. as the excuse for all its problems; and -- that offering an opening as we have to other adversaries, would remove Cuban "excuses" for lack of political and economic opening. End Summary. 2. Shadow Foreign Secretary William Hague gave a readout to Charge on March 24 of his recent trip to Cuba, during which he spent several hours with Foreign Minister Bruno Rodriguez, met the president of the National Assembly, Ricardo Alarcon, and visited a biotech center. Hague made news on his return after giving an interview calling for the United States to lift sanctions against Cuba (ref B). As a shadow minister and former leader of the Conservative Party, Hague noted to Charge that he had traveled to Cuba at the urging of the Vice President and Foreign Minister of Panama Samuel Lewis Navarro and that he had no interest in anything other than offering his observations. He pointed out that he has more freedom than HMG ministers who do not travel to Cuba because they cannot get meetings with Cuban counterparts if they plan to meet with human rights activists. Poloff Daniel McNicholas and Hague's Senior Adviser Arminka Helic also joined the Charge's meeting with Hague. 3. (C/NF) Hague assessed the new foreign minister as a "committed Communist," and said that he was slightly surprised that the Cuban leadership did not appear to be moving toward more of a Chinese model of economic opening, but were rather still "romantic revolutionaries." In his conversation with Rodriguez the discussion turned to political ideology, during which Hague commented that people in Britain were more interested in shopping than ideology. Rodriguez appeared disdainful of the notion and said one needed shopping only to buy food and a few good books. Hague noted that Rodriquez spoke English fluently and appeared to know the United States very well due to his tenure in New York at the Cuban Mission to the UN. Responding to Charge's question as to whether Rodriguez represented anything new, Hague said he heard nothing to make him think so. "U.S. Policy an Excuse for Cuba's Woes"
4. (C/NF) Hague indicated that U.S. policy toward Cuba continued to be used as an excuse by the country's leadership for all of Cuba's problems, including its lack of economic development, inadequate social provisions, and human rights concerns. Sanctions, he said, provided a "cheerful rallying point that brought Cubans together," and that the "national habit" of proclaiming hostility to the United States was alive and well. In his meetings Hague raised human rights concerns, and Cuban officials predictably claimed those dissidents who were in prison had been foreign agents, some of whom were taking money from the USG. 5. (C/NF) Hague reiterated the view that appeared in his March 20 press interview (timesonline.co.uk/tol/news/politics/articles 5941079.ece) -- that lifting U.S. sanctions would remove this well-worn excuse of the Cuban leadership, turn Cuba's problems back on them, and make it harder to justify why the country was not as prosperous as some of its neighbors. Cuba is like China was 30 years ago, he said. A change in U.S. policy (in reasonable stages) would put pressure on Cuba and offer further evidence that the United States is willing to open up to longtime adversaries. Hague's Cuban interlocutors made the argument that U.S. allies like China and Saudi Arabia had human rights problems as well but the U.S. was still able to maintain good relations with them; that sanctions were a "historical hangover;" and that Cuba had no intention of exporting revolution or posing a threat to stability in the region. Noting the support for a change in U.S. policy among OAS members, Hague said that a review of our Cuba policy might make sense, and represent a positive step in U.S.-Latin American relations.